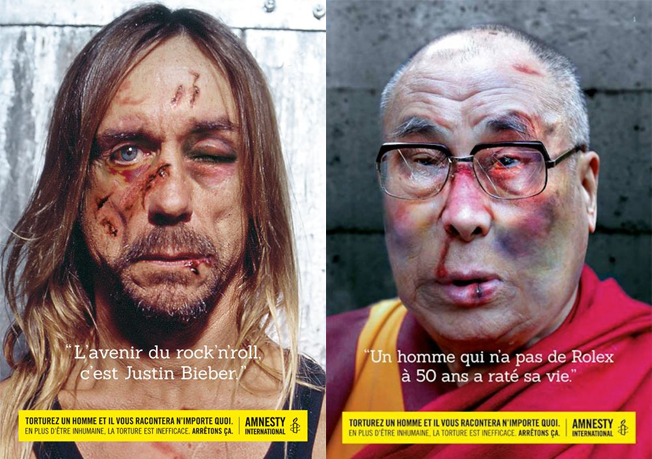 To prove its point that people undergoing torture will tell anyone anything (thus negating it as a viable intelligence-gathering technique), Amnesty International is pairing images of beaten, battered famous people with extremely out-of-character quotes they would say only under extreme duress. For example, Iggy Pop's jacked-up face (which isn't too far from how he looks after concerts) appears to say, "The future of rock 'n' roll is Justin Bieber." The Dalai Lama is the other notable face in this campaign so far; his fake quote is, "A man who does not have a Rolex watch at 50 years old has failed in his life." The tagline is, "Torture a man and he will tell you anything." This might be the funniest stuff Amnesty International has ever done, and it illustrates the point about torture really well. I wonder if Funhouse-era Iggy Pop ever thought he and the Dalai Lama would have any connection whatsoever.